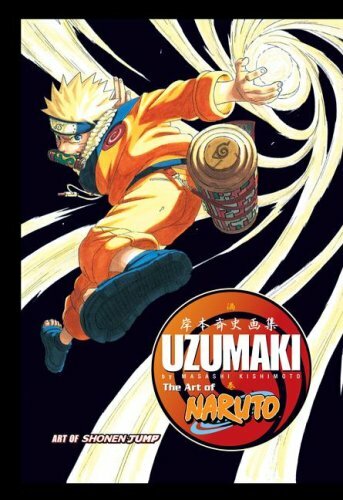 The Art of Naruto contains art done for the comic book covers and the Shonen Jump Weekly. The hard cover book is well bind and the paper stock is great. There's no dust jacket. The first page is actually a multi-fold page that unfolds to a wider page. For collectors of the manga comic book, the illustrations presented here will not be unfamiliar, except they are printed in a larger format. The colour reproduction is great. There are over 110 pages of them. A detailed step-by-step tutorial on creating the comic is included at the end. It's informative to read about the workflow and type of tools used to create the Naruto comic. Lastly, several pages are devoted to an interview with Masashi Kishimoto. It talks mainly about the characters and a little on himself.